Since 1979, California’s Wild Horse Sanctuary has been at work rescuing hundreds of wild horses and burros. Today, some 300 of these symbols of the American West roam free and live out their natural lives at the 5,000-acre Wild Horse Sanctuary, near Shingletown, California, (northeast of Sacramento). Now, to celebrate the 30th anniversary of its rescue mission, this remarkable organization is throwing open its doors with trail rides, an adoption weekend, and an open house tour. These are challenging times for all horse owners, with the price of feed rising; and for rescue groups, donations becoming harder to find. If you care about horses and burros, this is one organization which has a track record of channeling that caring spirit into real help for these animals. The 2009 trail ride season at the Wild Horse Sanctuary runs from April 25-26 through Columbus Day Weekend (October 10-12). Wild Horse Sanctuary rides follow trails created by the wild horses and burros through a landscape of oaks and pines, lava rock strewn meadows, wildflowers, meandering streams, and populated by a diverse wildlife. Two-day rides (including dinner and lodging) run $435. On Saturday, August 15, 2009, the Wild Horse Sanctuary will be opening their gates and welcoming visitors at their annual Open House from 1—6; festivities include a docent-led walk to view wild mustangs and burros, free horse rides for kids ages 10 and under, raffle, prize drawings, barbecue, and more. Then on October 24, there’s an adotption weekend where 20 or more wild horse and burro colts and fillies will be available for adoption. 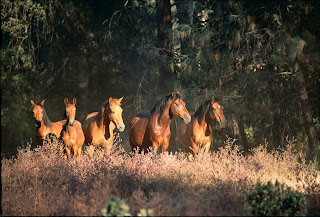 To learn more about the Wild Horse Sanctuary, make a donation or plan a visit, call 530/ 474-5770 or visit www.WildHorseSanctuary.org.